My favorite dance partner by far is my hoop. I’ve danced in some form or another my whole life, but it wasn’t until I broke my ankle and it hurt too much to even chair dance that I realized just how important it was to me. I need to move just like I need to breathe. I vowed that when I was healed I would find some way to dance every day. I tried, but it was hard to get up the energy to just crank the tunes and bust a move every single day. It wasn’t until I discovered hoop dance that I developed an (almost) daily dance practice. Hoop dance, or hooping as it’s also known is part circus, part dance, part meditation for me. 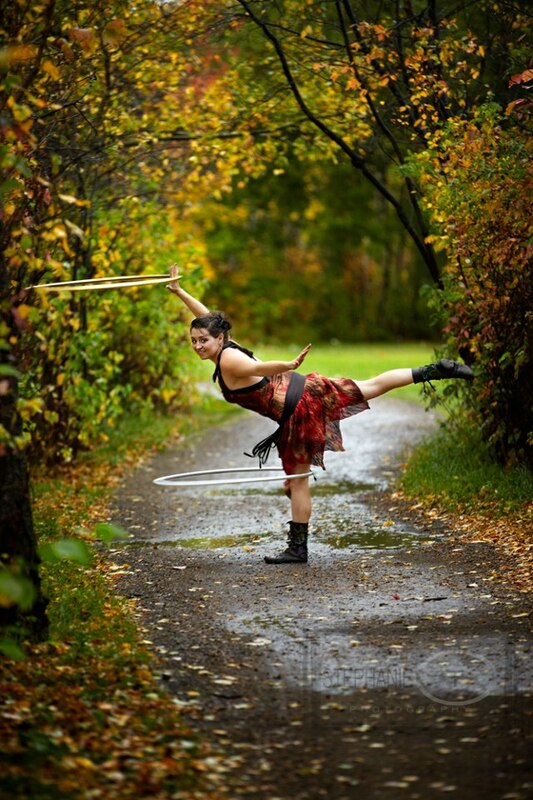 I love doing tricks with my hoop, but I also love just dancing in my hoop while it whips around my body. It’s incredibly satisfying and fun to hoop dance, but I think the best part of it for me is the community I’ve found. I have met so many new friends and amazing people from around the world. I have a few theories about why hoopers all seem to be so awesome, but I think it boils down to the fact that these people aren’t afraid to have some fun. There is an element of silliness to dancing and manipulating a plastic circle, no matter how seriously you take your art, it’s still a lighthearted toy, as well as being so much more.